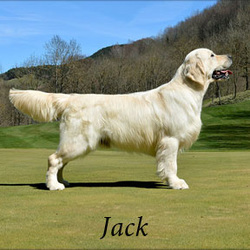 Jack comes to us as an AI (artificial insemination) sire from Thevenet Golden Retrievers and Santiago Gadea Castro of Spain. We are so fortunate to be adding Jack to our breeding lines in our program, and excited to realize his influence in our genetics. Already with an impressive resume of honorifics, this stunning young sire has offspring winning in the ring. Thank you to Santi for giving us the opportunity to work with Thevenet Golden Retrievers and have Jack be a part of what we are doing here at Snitker Goldens. Click to view Jack's Pedigree and Health Clearances. All photos and videos used with permission and ©Thevenet Golden Retrievers. To learn more about Jack, please visit his personal page.